We collected advertised prices for residential data plans offered by 40 community-owned (typically municipally owned) Internet service providers (ISPs) that offer fiber-to-the-home (FTTH) service. We then identified the least-expensive service that meets the federal definition of broadband—at least 25 Mbps download and 3 Mbps upload—and compared advertised prices to those of private competitors in the same markets. We found that most community-owned FTTH networks charged less and offered prices that were clear and unchanging, whereas private ISPs typically charged initial low promotional or “teaser” rates that later sharply rose, usually after 12 months. We were able to make comparisons in 27 communities. We found that in 23 cases, the community-owned FTTH providers’ pricing was lower when averaged over four years. (Using a three year-average changed this fraction to 22 out of 27.) 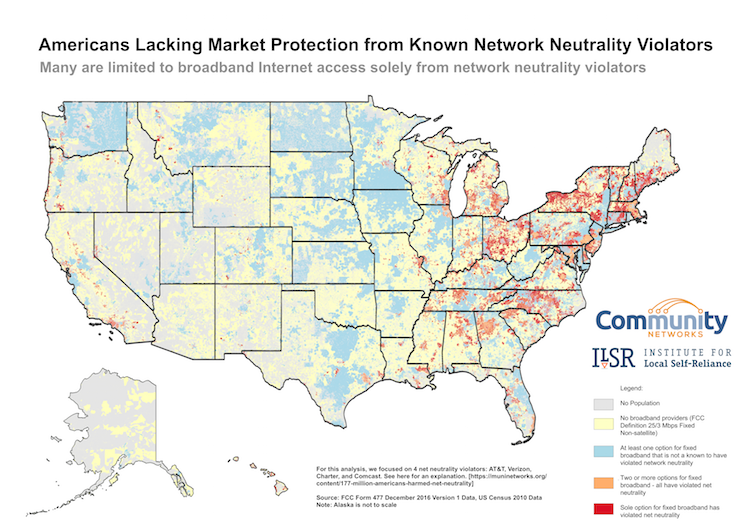 In the other 13 communities, comparisons were not possible, either because the private providers’ website terms of service deterred or prohibited data collection or because no competitor offered service that qualified as broadband. We also made the incidental finding that Comcast offered different prices and terms for the same service in different regions. 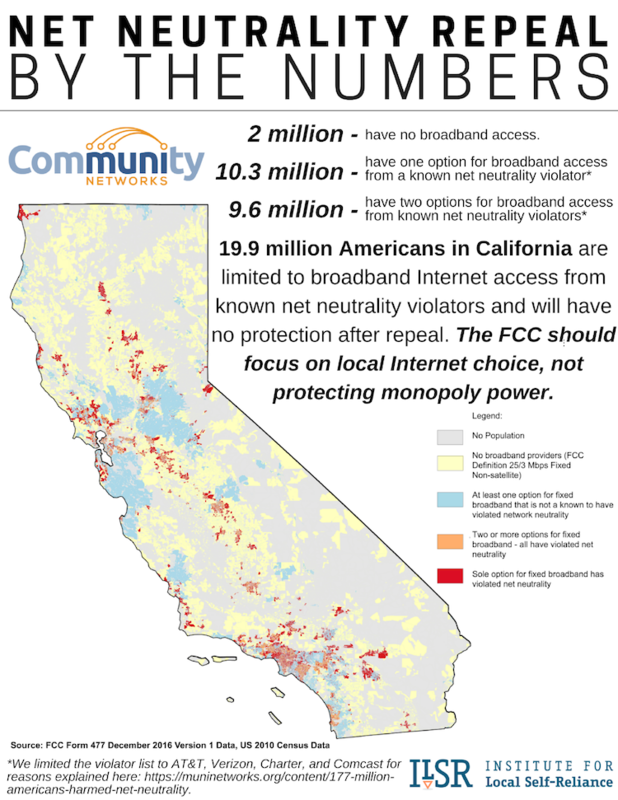 The FCC collects data from Internet Service Providers that reflects census blocks where they offer service to at least one premise. Currently, the Commission does not collect information about rates subscribers pay. A new report from the Berkman Klein Center dives into prices subscribers pay and also looks at trends from national companies as well as local publicly owned networks. The report, Community-Owned Fiber Networks: Value Leaders in America, supports what we’ve always found — that publicly owned networks offer the best all around value for the communities that make the investment. A holiday poem in the style of "How The Grinch Stole Christmas" by Dr. Seuss. But the FCC’s Grinchy Pai, former lawyer for Verizon, did not! Pai hated net neutrality! He despised it, he dreaded it! And on December 14th, he and his cronies, they shredded it. It could be, perhaps, that he wanted more dough. ISPs could make more with lanes fast and lanes slow. His choice pissed off subscribers by many degrees. Americans cried out in anger and dismay! “It’s good for free speech and new businesses too! Selling, reporting, and artistic debut! We need it for school kids who have tests to take. We need it for far away doctors with prognoses to make. We need it so businesses can hit the ground running. We need it for working from home, for homework, for funning. We need it to save money. To get good Internet service. “You have market protection,” he said with a snort. But ILSR elves proved there was nothing of the sort. The elves showed very little, almost no competition. 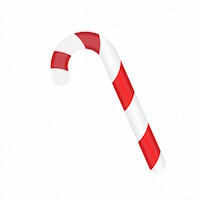 But Grinchy Pai didn’t care for the net neutrality tradition. He wouldn’t listen to pleas to stop and investigate. Even millions of fake comments didn't make him hesitate. His planned to kill net neutrality completely. His overlord ISPs would reward him so sweetly. 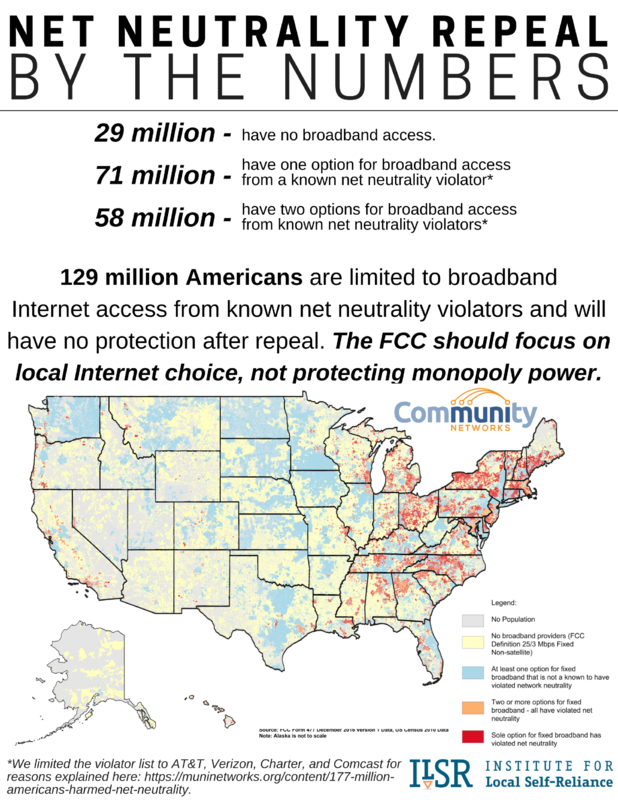 In addition to shredding network neutrality, the FCC is making it more difficult for us to obtain high-quality Internet access. Under the Obama administration, the FCC raised standards for broadband, but the new administration is set on driving us backward. Chairman Ajit Pai and the other Republicans in the FCC want to equate mobile Internet service with home connections. They also want to revert to a slower definition of broadband. We have to show them that their plan is ludicrous and shortsighted; the #MobileOnly Challenge is a start. What Is The #MobileOnly Challenge? It seems as if Pai and his chums aren’t aware of what it’s like to depend solely on a mobile connection, especially for people in places where mobile service is spotty or slow. In order to share the experience, the Institute for Local Self-Reliance, along with nine other organizations and FCC Commissioners Clyburn and Rosenworcel, are supporting the #MobileOnly Challenge. For one day in January, participants will put away their laptops and use only their smartphones to access the Internet. During the day, they will report on their experience via social media with #MobileOnly in the tweet, FB post, Instagram post, or other notification about the experience. The FCC expects to vote on the mobile Internet access and broadband definition question by February 2, 2018. Right now, the Commission defines broadband as 25 Mbps download and 3 Mbps upload; they want to redefine that speed to 10 Mbps/1 Mbps. January will be the time to let them know that we don’t want a slower Internet — we want an Internet for the future. Choose one day in January to take the challenge and on that day use ONLY your mobile device to access the Internet. During that day, share your experiences on social media using #MobileOnly. When your day is over, encourage your friends to also take the challenge. Don’t forget to contact @FCC during and after your challenge to let them know that mobile only is inadequate for Americans in the 21st century.